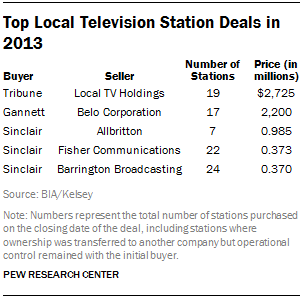 Sinclair Broadcasting acquired more individual stations than any other buyer, snapping up outlets owned by locally based companies like Fisher Communications in Seattle and Allbritton Communications in Washington, D.C. 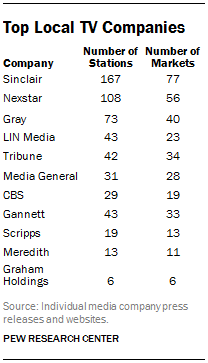 The company already owned the most local stations of any group; if all pending sales go through, Sinclair will own or provide services to 167 television stations in 77 markets, reaching almost 40% of the U.S. population.14 Nexstar Broadcasting made moves to increase its portfolio to 108 stations in 56 markets. 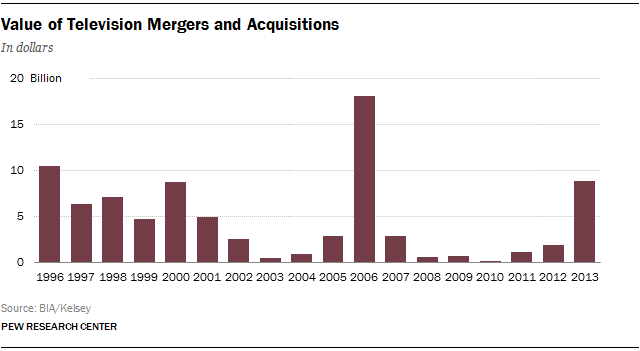 In 37 of those markets, it will own or provides services to more than one station.15 Nexstar’s chief executive, Perry Sook, predicted the “rolling M&A thunder” would continue throughout 2014, and it has.16 In March, Media General announced plans to buy LIN Media’s 43 stations for $1.6 billion.